You don't usually find cheerleaders leading the crowd at a softball game, but that's no reason these athletes should play without getting a little support and a shot of team spirit. Whether the entire squad agrees to attend the game or you and a couple of squad members attend on your own, a few good softball cheers can go a long way toward livening up the fans and inspiring the team to victory. Cheerleading at a softball game is going to look decidedly different than when you're cheering at a basketball or football game. Nonetheless, there's quite a bit you can do to inspire the fans to start rooting for their favorite team. The key is to use cheers made up specifically for this sport instead of basic cheers they can hear at almost any other game. Here are a few cheers and chants that will be perfect for this sport. Hit it on the fly! Knock it to the sky! as you whiz on by! past the batter and the plate. Fielders, Fielders Catch That Ball! The ball's coming to you. from the sky so blue. Yeah, that girl is bad! A badder batter battin' there today! WHOOP! WHOOP! Yeah, that [player's name] is BAD! Poppa, Poppa, look at me! 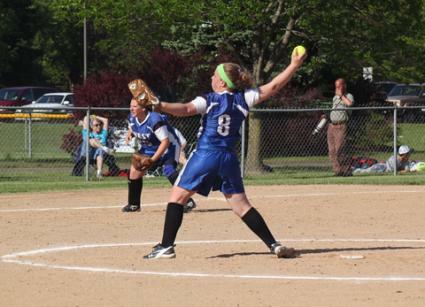 I'm a fastpitch throwin' machine! Ain't got time to feel no pain! I'm too busy winning this game! Check it out, wind it up, throw it down the line! One more strike will do me just fine! (All together) One-two, two-three, three strikes...YOU'RE OUT! Get Up and Jam It! Softball fans might not be used to organized cheering since cheerleaders typically don't attend games for this sport. This means you might have to let them warm up to the idea a bit before they begin to join in. One of the best ways to get the crowd involved is to sit amongst them and offer group cheers at appropriate times throughout the game. One final piece of advice; never join in when the crowd begins chanting cheers that are inappropriate or make fun of the other team. No matter what, the rules of good sportsmanship still apply, so keep the squad's cheers supportive, not offensive..